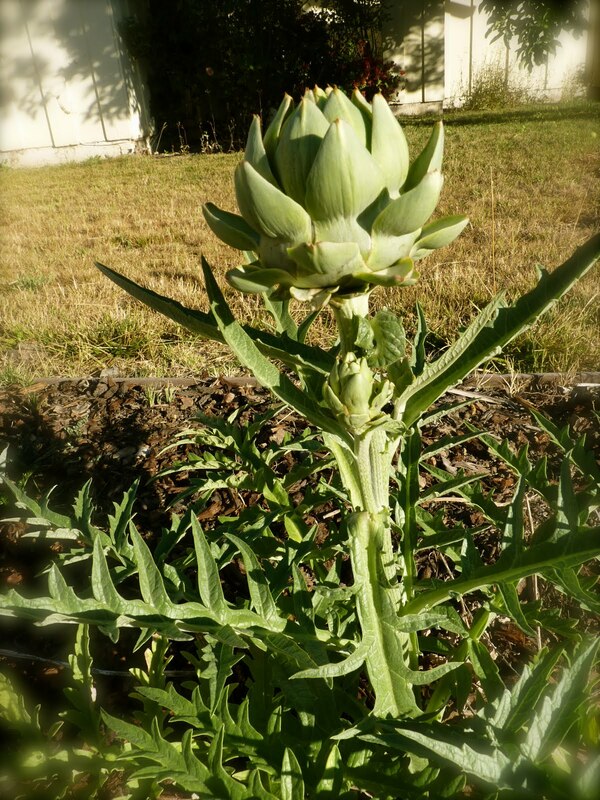 I planted a few artichoke seeds, despite that everyone told me that they are hard to grow from seed. The general recommendation is to buy a plant or get a divided piece from someone you know. Anywho, we seeded a few. Two seedlings emerged. So, initially we had two plants. Then I transplanted them close to our sidewalk, resulting in my neighbors dog to mistake these tiny plantlings for a tree. So, I had to transplant them AGAIN and this time my man thought I had killed any hopes for harvesting artichokes. These two guys looked sooo sad: their leaves were wilting and for weeks they looked just miserable. Since we WANT artichokes, I seeded a few more and another 4 seedlings emerged, who I planted alongside the other dead-thought-ones. So we kept caring for the first ones, they eventually started to look better and when we returned from our trip to Utah, one of my first chokes was sporting a flower bud. YES!!! It is the flower bud that we are eating in artichokes. Once the flower starts blooming (a beautiful blueish thistle), it becomes inedible. Of course the question is: When to harvest you artichoke. You want to leave it on the plant to allow it to be just perfectly ripe but you don't want to wait too long for it to start blooming. So, every day, we have been checking on them and TODAY I thought, it was time for artichoke appetizer! Cut them about 2-3 inches below the bud. We boil them in a pot with about 3 inches of water for 25-40 minutes. When you can pull one of the middle pedals out, they are done. While they are boiling, I prepare the dip: Melted butter with lemon juice, pepper and salt. See the two sideshoot buds. Yum on the way. Ahhhh! Cannot wait for the next choke to be ripe. 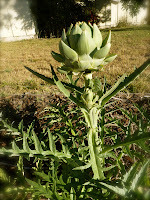 Harvesting time for artichokes is from late July until frost. The centre one is typically the biggest one and the sideshoot buds are called 'baby artichokes'. Pretty misleading, huh? I always thought that they harvest them prematurely but it is simply the next 'generation' of buds. OK...we're gonna stuff 'em, steam, and roast 'em. That's how u eat an Italian artichoke!